So...... 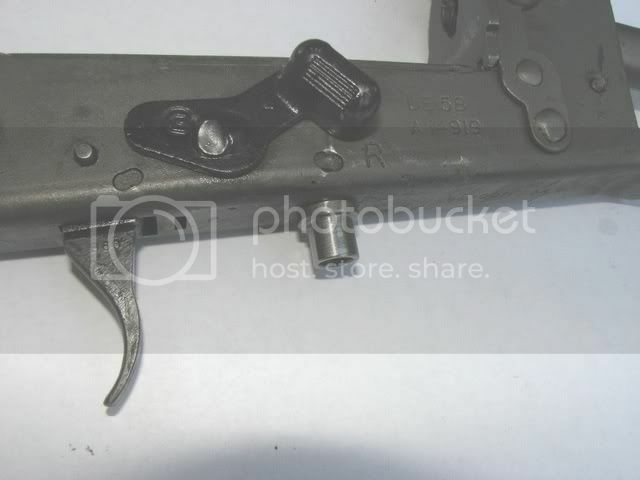 I have a Brit lower that has had the pistol grip stud removed by the good ol' beavers at Century. 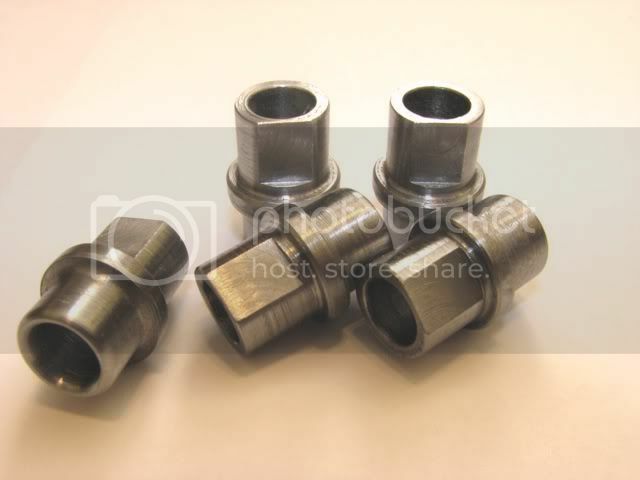 I bought the bronze bushing that has been talked about here ad infinitum. Not impressed. 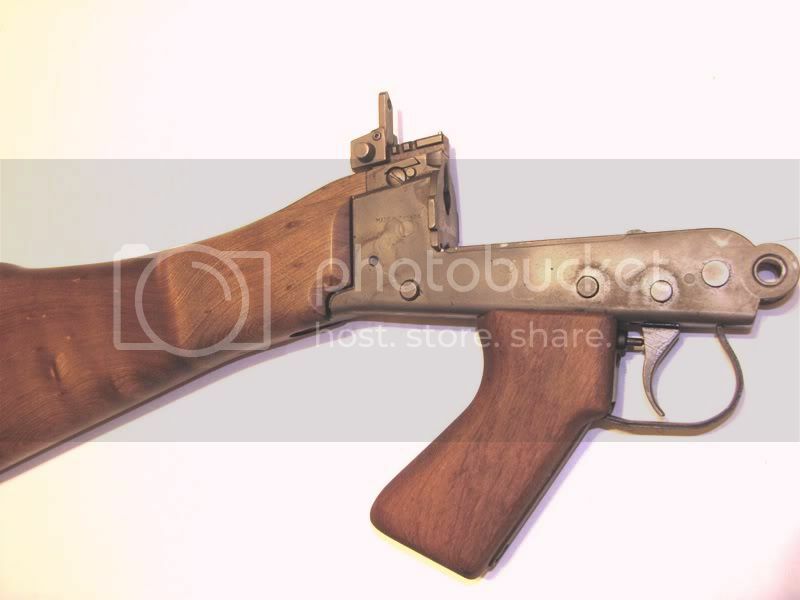 It doesn't look correct, it has to be brazed on to the receiver if it is to locate the pistol grip. I know it won't be seen when the rifle is together, but it's just not right. 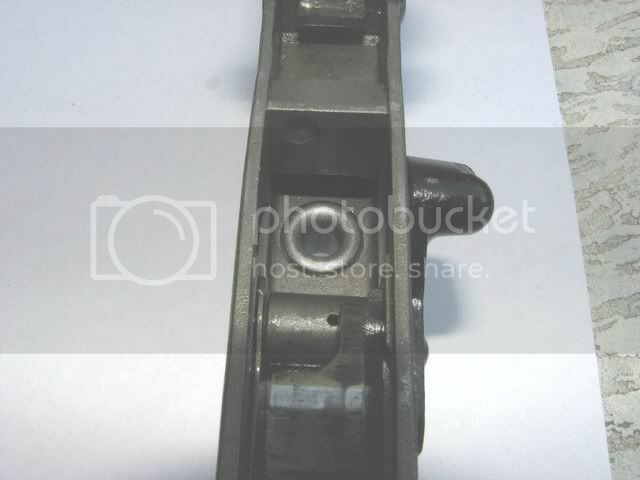 I checked out one of my Aussie lowers to see how the original bushing is fitted. The original bushing extends into the inside of the frame and is peened over (or swaged, or riveted, whatever you want to call it). I thought "I could make that", so out to the shop I go (you know, the place where the cars are supposed to be parked, but they can't fit because of all the tools/junk). New bushing ready to go. 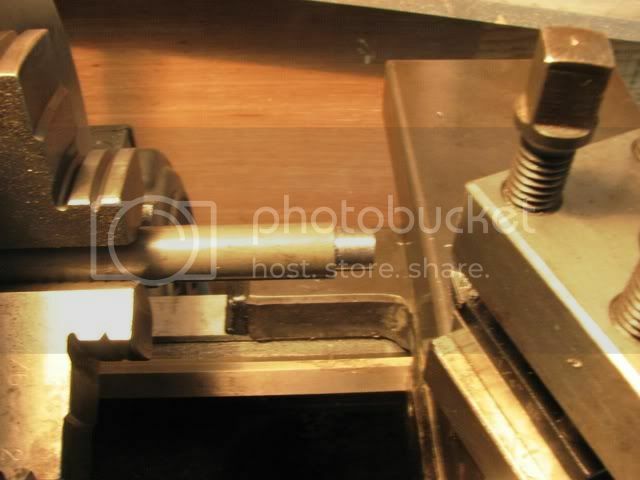 I converted a cold chisel into a swaging/peening/riveting tool. Now ready to apply hammer. A press would be more civilized, but my sawn-off sledge hammer proved to be adequate. Looks and performs like the original. Saved from the beavers and political correctness. When the whole thing gets parked and painted, only the beaver teeth marks will give a clue that the bushing is not original! Well done. Man is truly "the tool-bearing animal". Hey, schlom's, he did a very nice and neat job, didn't he. Very well. I would post this sort of stuff if I could just post nice pics like he did. It may save a bunch of noobs askin' the same questions. Plus, it actually is worth a thousand words or so. Explaines a lot with a few pics. Nice job. hey, i've got 3 or 4 of those things lying around...how much to send them to you and have them repaired? I'm not Paranoid your just naive. Did you hear somthing?? hey your not real anyway, I heard it again. Bravo, Good sir. What material did you make the bushing out of? Was it bronze like the replacements that are out there? Well... I had a think about it. If you can get a lower to me, I'll install a bushing and ship it back to you for $25. And $18 for each additional frame after the first one. OR, I could send you some bushings, a tool and a dolly. 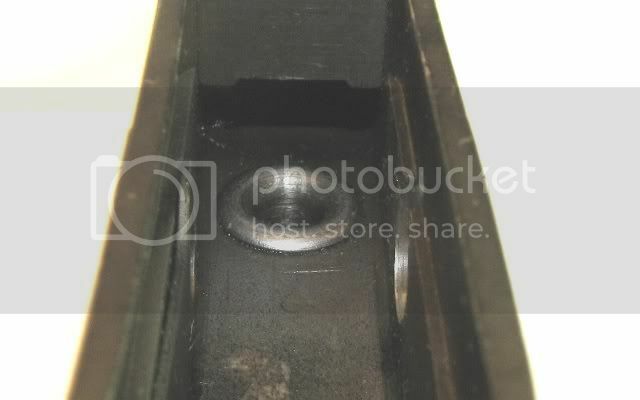 The dolly I used has a hole drilled in it to exactly match the minor diameter of the bushing -25/64". 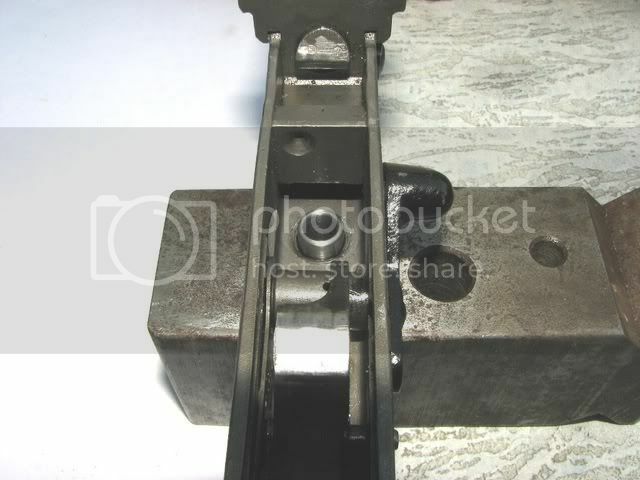 A solid surface (like the anvil on the back of a vice) may work for peening the bushing over, but I don't know -I haven't tried it. 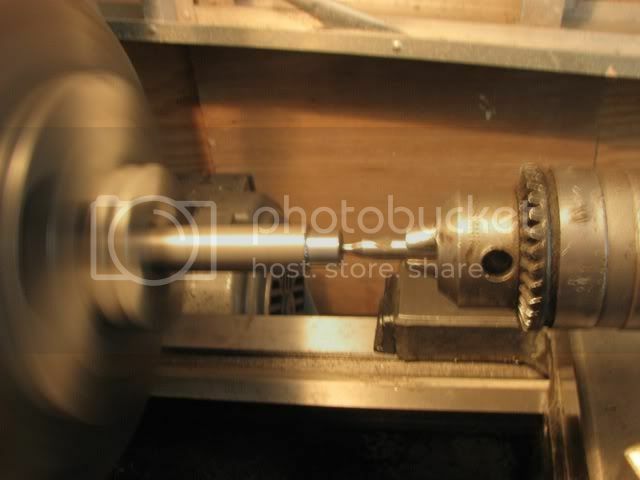 I only know that a dolly, drilled to match the bushing, does work well. $10 per bushing, $15 for the tool and $5 for a dolly, plus $10 for insured postage (I insist on insurance on everything I post now). PM me for details if you want to do it. It is Bright Round Mild Steel. The camera I use has 'Macro' and 'Super Macro' modes. Makes it easy. 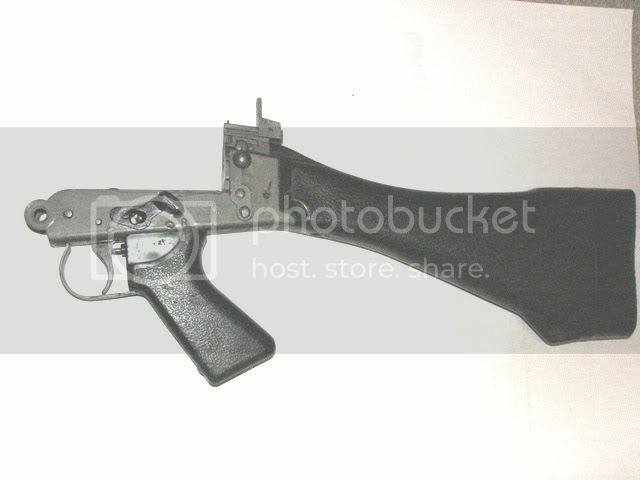 have you done a trial run with the pistol grip and associated parts to check function/fit etc? 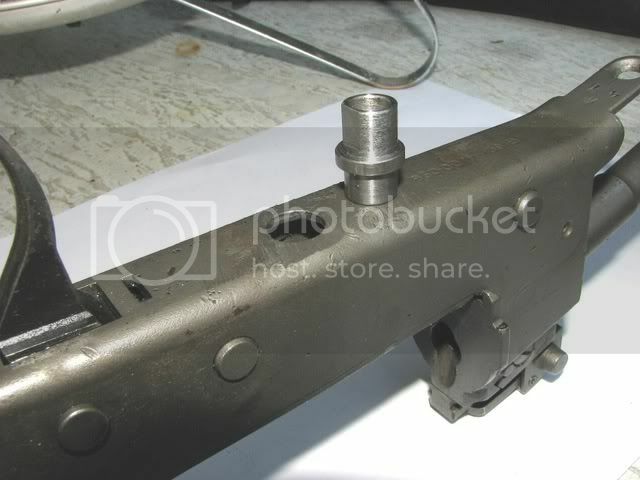 The maranyl pistol grip is a snug fit on the flange of the bushing -it almost 'clicks' on. 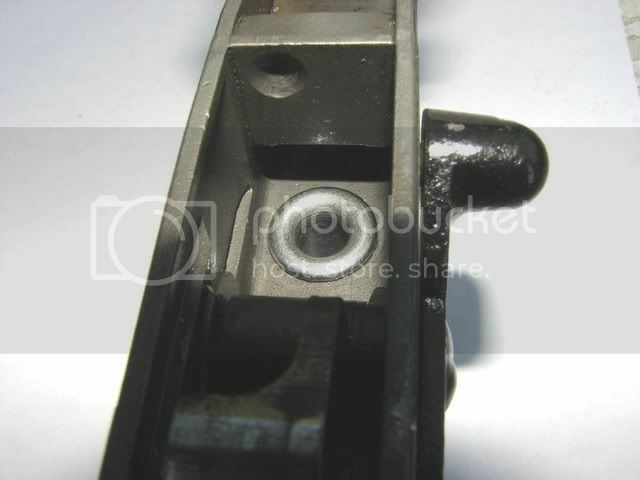 The trigger bottoms out well before the plunger comes into contact with the bushing. The plunger may have been messed with. 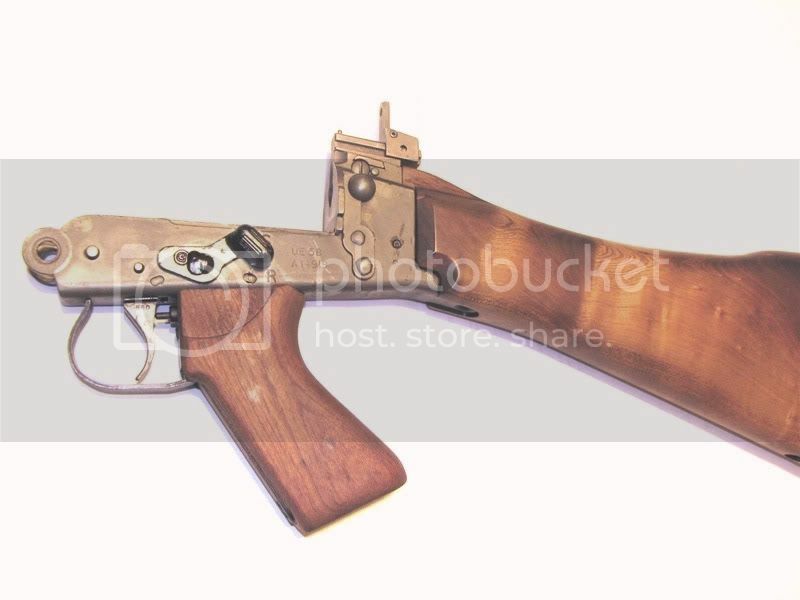 The never-used Aussie pistol grip fit fine. The plunger does seem to bottom out on the bushing here -after the sear has released, of course. A bit of Aussie wood on the old British hag sure gives it a touch of class! Very nicely done, GREAT JOB!!! 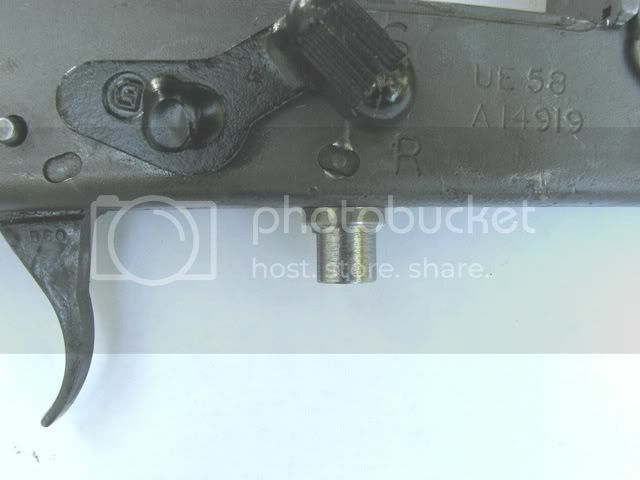 another question....some of the holes where the pg stud was, after century ground them off, are larger on some of my lowers than others....will this still work or would the new studs have to be specific to those that have a larger hole? 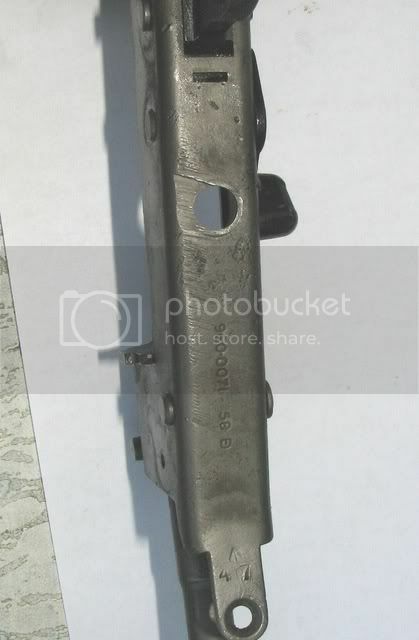 ....some of the holes... are larger on some of my lowers than others....will this still work or would the new studs have to be specific to those that have a larger hole? I only have one neutered frame, not much of a sample size. The hole in my frame is .400". If you use a rule, that would be 25.5/64" or about 10mm. 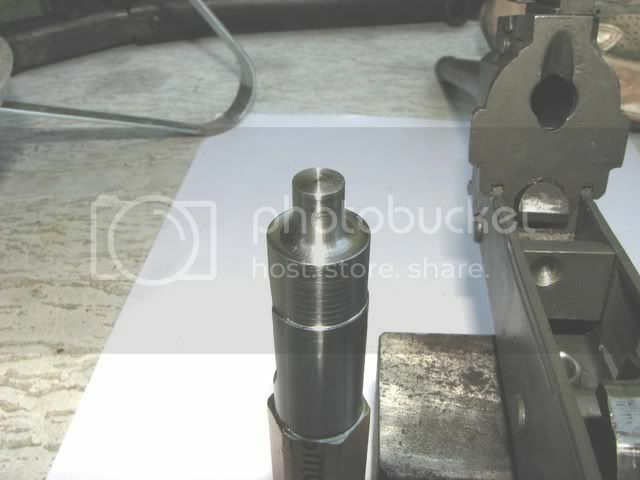 The minor diameter on the bushing (the external part with the small flat) is .388". This seemed like a good fit, so I made the top part of the bushing -that goes inside the frame and gets peened over- the same size, .388". 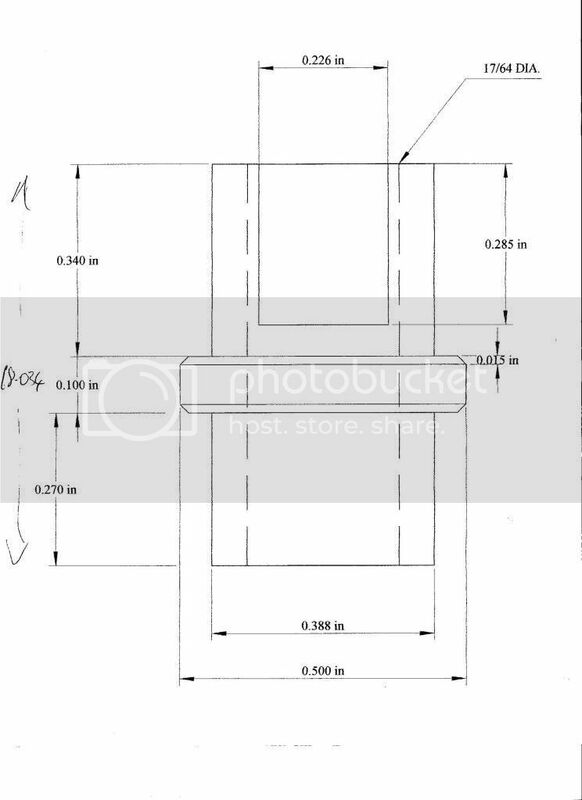 If the hole in any of your frames is much larger than .400" (I can't imagine they could be much smaller than that), I would make a bush with an extra shoulder to take up the slop and locate it in the center of the hole. If anyone has a better idea of the factory spec. dimensions of the bush, feel free to chime in! "Liberty will continue to erode, but not so fast we’ll jump out of the boiling pot"
.285" high x .225" wide. Depth of cut would be .032". New pistol grip studs ready to go. I tell ya, I'm stoked at how well these have turned out. I didn't think it would be possible to flare over these bushes with just simple tools, I thought they would split or collapse or something. Now I just wish I had bought those neutered receivers I saw at Knob Creek last year. I made the exact same bushing, but was planning to tig it in because just like you I expected it to split when you try to install it. Also angry beavers really opened up the hole when the drilled the old one out. I need to rent your tool, how much ? I would rather sell a tool than rent it, but if you only need it for a brief time, I can work with that. $15, posted to you. PM sent with details. How big did the hole end up? Did they actually drill all the way through? 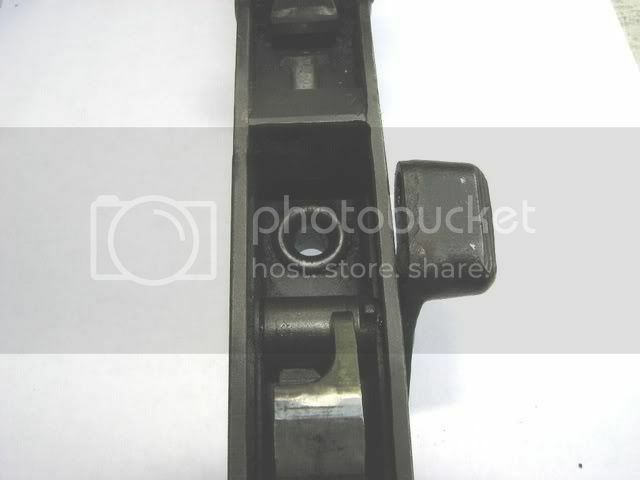 The lower in the picture above had been neutered with a drill, but not much damage done, just a bit of a chamfer. Not enough to affect anything. The original hole is about .4" and the major diameter of the bush is .5". There is not a lot of wiggle room there if the hole is opened up. I will have to get her out of the safe and take some measurements and pictures. Like i said in the PM, I may mave to make a copper dam and do some fill welding to restore the edge of the hole. Hat's off for a nice job. I must confess that I usually use sections of turned down barrels, and swage them in the press. Works well but yours is cooler and more correct. When is the bleeding going to stop? What's the D on the hole thru the middle of the bushing? I don't have an example here to take it from. That is a most excellent repair indeed.. From my layman's perspective it looks better then the original. 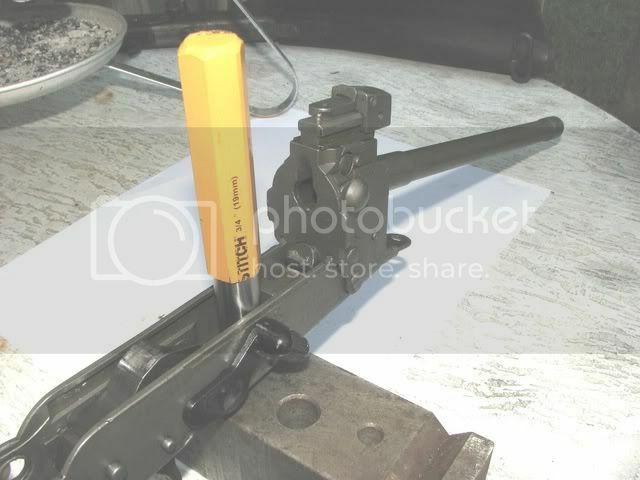 Well thought out and perfectly executed..
Are you willing to make / sell bushing and tool set? Ooops!! I should have updated this thread. I am moving to Germany shortly, and I sold the last of the bushes I made a couple of weeks ago. My lathe is now in storage somewhere in Nashville. In other words, I got nothin'. If anyone else wants to make some, I could help out with dimensions and the like. I posted earlier about the bushing I made, here are some pictures. The bushing on the left is the one I was going to weld in. After Hoot's success I made the one on the right to be staked in. After Hoot announced he is leaving for Germany I bought his staking tool. 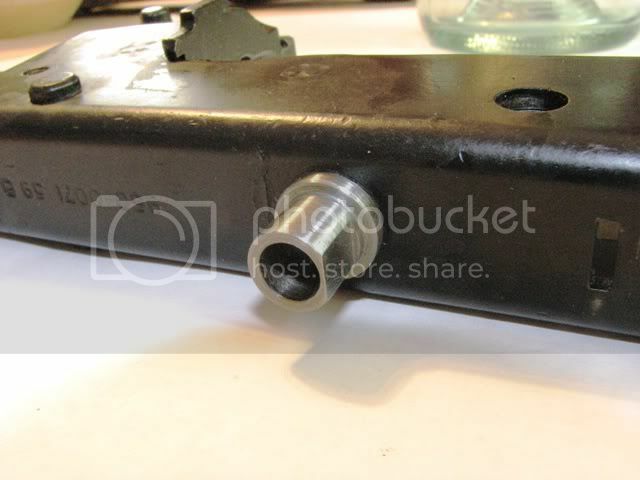 I may offer bushings and a tool rental for the do it yourselfer's, once I have used the tool myself. I do not plan on offering a service of repairing. That is some good looking work there, Nitro! Here is my attempt at CAD, the bush is upside down, but I'm sure you all can work it out. Put a bit of grease or some other lube on the tool to help it flare the bush neatly. I've been making them out of Return tube screws and brazing them. I love the way you swaged it. I probably would have brazed or welded something in myself, if I had oxy or welding equipment on hand. Thank's Hoot, same back at ya. Bravo on the CAD drawing, looks good to me. Made a dolly for staking the bushing, I think I will do it in a press. I just want to compliment you on your workmanship and ingenuity. 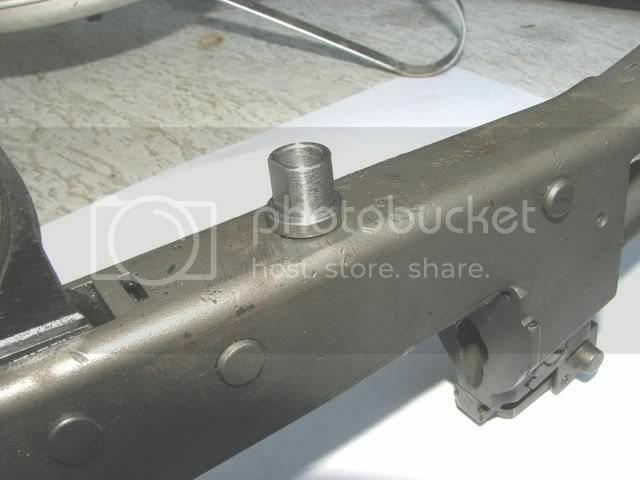 That is truly a nice pice of work engineering both the bushing and the tools to install it. I think I will buy a set of the tools from you and perhaps some bushings as well. I'd love to help you out, but I'm in the process of moving overseas. My house has been cleaned out, my machinery is in storage and I'm living out of a suitcase at a friends place. I'm sure someone else would be happy to turn up a few bushes, and Nitro will consider renting out the tool that he now owns, so you should be able to get it all sorted. After I get the staking tool from Hootsmon. I will conduct a trial on my lower. If it turns out well, I will consider making bushings and renting the tools. The tube will require less work to make the bushings but may not stake well. PS: This is a hobby and addiction for me not a business. I too have a need for 2 or 3 of the bushies and tool rental after all is sorted out. Well I installed my bushing with the sledge method. It worked but was not exactly elegant. I will try the sledge method on 1 DOM type and the press on the other 2. I've found in any situation involving hammering that multiple light strikes works far better than a few sledge hammer strikes. 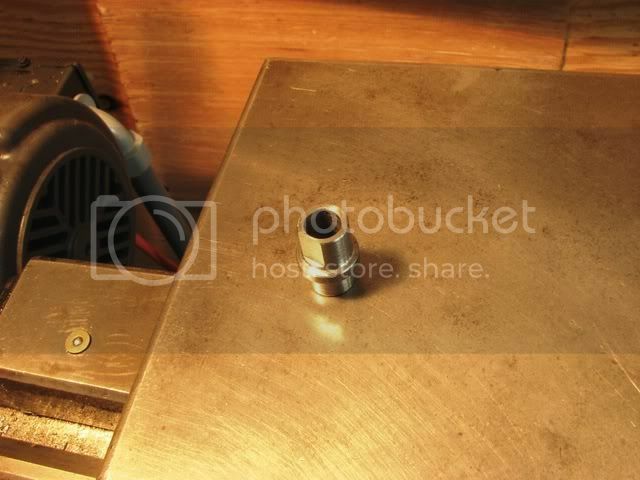 I use a tickle trigger air hammer. This differs from the $20 Harbor freight air hammer. The latter has only two settings: Bash and off. The tickle trigger unit has fingertip control from slight light slow taps to heavy wallops. I use it for everything from vibrating the rust off seized fittings (brass tip) to installing AK barrels and pins, and setting rivets. 3x for most stuff. 4x for heavy stuff. I'm sure it would flare your rivet better than a sledge and with more speed than the press. I rarely pick up a ball peen hammer any more. The tickle trigger air hammer has so much more control. Here is the result of the the test I conducted with the DOM. It worked well, now just need to source material as I have since run out. I will post a services ad in the MP for tool rental and bushings. 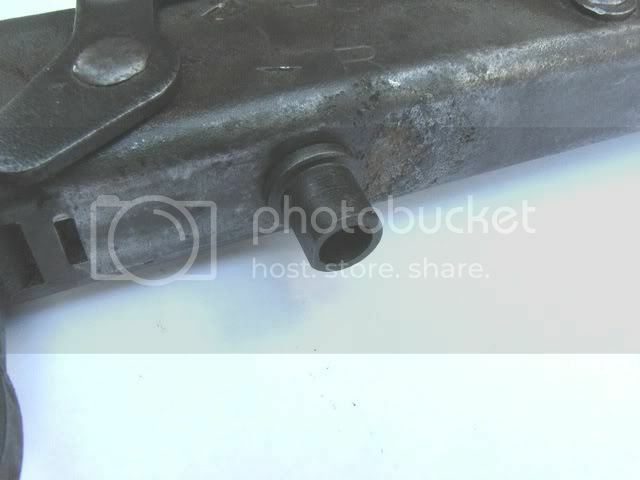 wish i woulda known about this before i did what i did which is just weld a post up there!! Do you still have tools and post in stock?? The tool is out for rent currently. Once returned I have another customer waiting. I will put you on the list if you wish.